I recently got a watermelon in my FarmBox, and since it usually takes a while to eat it, I decided to juice it instead. We’ve also been juicing cucumbers, and I thought that those tastes might be pretty good together. 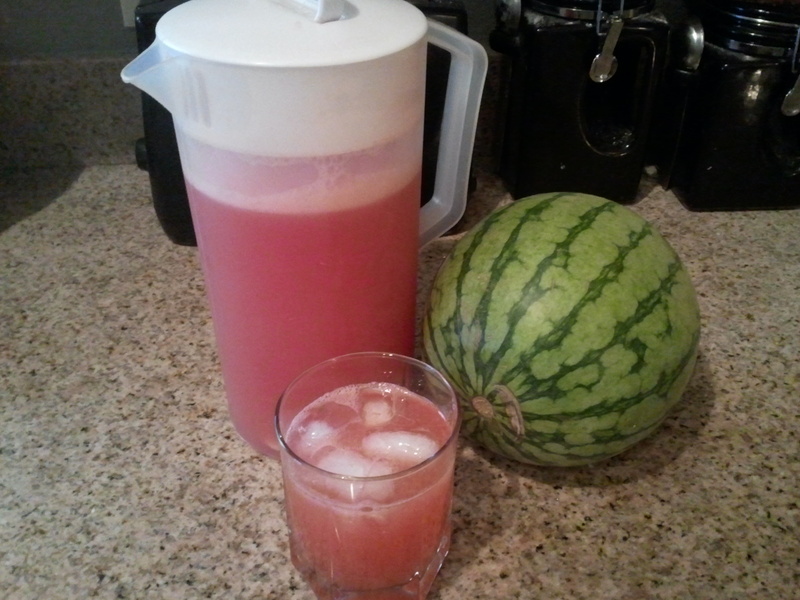 So, I did some searching just to make sure, and came across a recipe from Martha Stewart’s website for Watermelon-Cucumber Coolers. I just made it minus the vodka, although with the day I was having, I could have used the vodka, I think! My older daughter didn’t think it was sweet enough, so some extra honey would work, although my husband, younger daughter, and I, all thought it was perfect the way it was. Run watermelon and cucumber through your juicer. If you don’t have a juicer, you can use a blender to blend each until smooth, then pour through a fine mesh sieve to remove pulp. Combine lime juice and honey. Add to the watermelon and cucumber juice. Add vodka, if desired. Serve in glasses over ice. Recently, I was chosen to participate in a program through Influenster to try out Lifeway Kefir. Now, I had previously heard of Kefir, but I had never tried it. However, it was on my list of things to try, and this opportunity was perfect! The Lifeway Foods story begins in 1986 with kefir, a milk-based cultured drink that is popular in Eastern Europe and is said to be more nutritional than yogurt. That year, Russian immigrant Michael Smolyansky began manufacturing kefir in his basement to bring the taste of his native country to the U.S. After Michael Smolyansky passed away in 2002, his daughter Julie Smolyansky assumed the role of President, while his son Edward Smolyansky assumed the role of Chief Financial Officer and Treasurer. Today, Lifeway is the country’s leading manufacturer of kefir, with multiple flavors and varieties that include lowfat, whole milk and organic versions as well as a children’s line, and a provider of other probiotic natural and organic dairy products for health-conscious consumers. What I also like about Lifeway Kefir is that they make it using organic milk from grass-fed cows, also free of growth hormones and antibiotics. Plus, looking at the ingredients list on the side of the bottle, I know what all the ingredients are and they use natural flavors and coloring. That’s a big plus for me. My store had limited products, but I chose to get the 32 oz Low Fat Strawberry Kefir. I poured a small glass for myself, my 4-year-old, and my 6-year-old to try just plain. We loved it. My 4-year-old has recently become very picky, but is a big fan of yogurt. She really liked this drink. My 6-year-old is going through a bit of a fussy food stage, where some new things are icky no matter what, but she only had good things to say about it. I liked the creamy, thick texture, and the strawberry flavor is right on. It’s very similar to other yogurt smoothies that I’ve had before. I think it’s great just plain, but I think it would also be good over cereal or granola in the morning for breakfast, or as an addition to a frozen fruit smoothie. I’m hoping that the other grocery store in town has a bit more selection, and maybe even the Frozen Kefir. The 32 oz was priced at $3.89 at my local Safeway, which I think is reasonable considering the price of other yogurt. With as much as we enjoyed it, I’m hoping to get this into our monthly grocery budget to have on a regular basis. Disclaimer: I received a voucher to purchase 1 Lifeway Kefir product complimentary from Influenster for testing purposes. All opinions expressed are unbiased and my own. I think my favorite thing about fall is getting fresh pumpkins to bake with. Our favorites are pumpkin pie, pumpkin gingerbread muffins, and pumpkin pancakes. 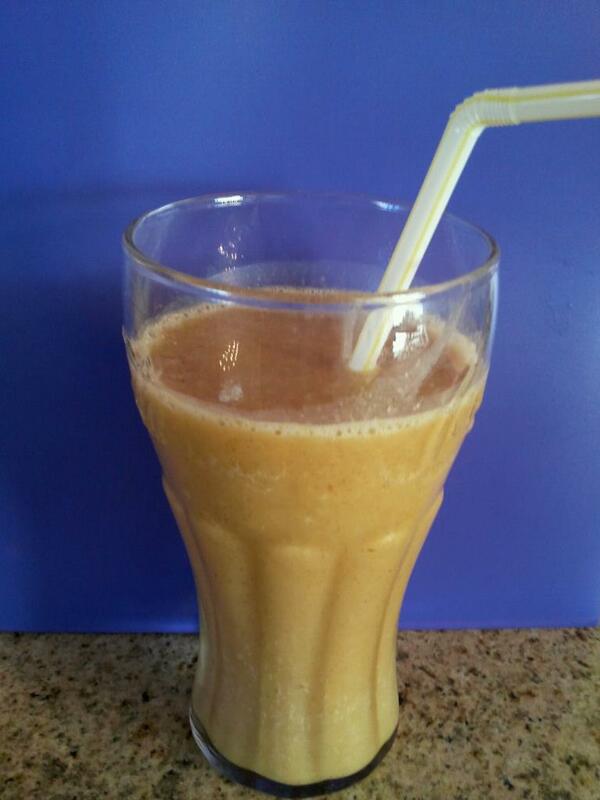 So, when fellow Bountiful Baskets participant posted a recipe for Pumpkin Smoothies, I looked it over, realized I had all the ingredients, and decided we needed to give it a try. The recipe is from a picture that Oasis Advanced Wellness posted on their Facebook page about the Health Benefits of Pumpkin. Combine all ingredients in a blender until creamy. I’ve been trying to use my juice extractor more, so with getting kale this week from Bountiful Baskets, I decided to try a juice with kale in it. In searching for other vegetables and fruits to juice along with it, I found that carrots and apples were a good combination with kale. I had carrots, but no apples. I did, however, have some peaches, so decided to give it a try. 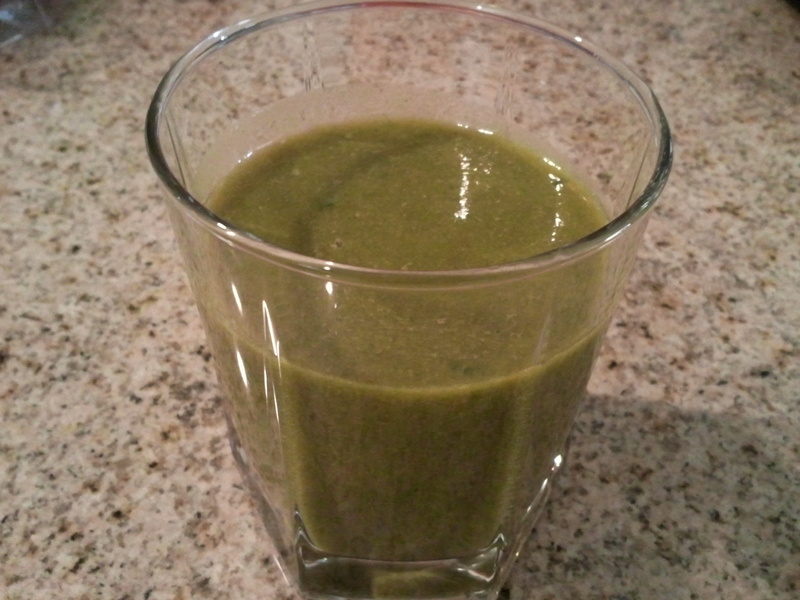 This is my first juice using vegetables, and I thought it tasted pretty good. My 3-year-old thought it was good too, but my husband and 5-year-old turned it down. Remove kale leaves from the stem and push leaves through juice extractor, using the carrot to push the leaves through. Follow with the carrots, then peaches. Serve over ice. Oh, this was yummy! My kids are loving all the fun drinks we’ve been making lately, like the Watermelon Lemonade and Strawberry Lemonade Chiller, I’ve made recently. This Cherry Lime Chiller was no exception, it was great! 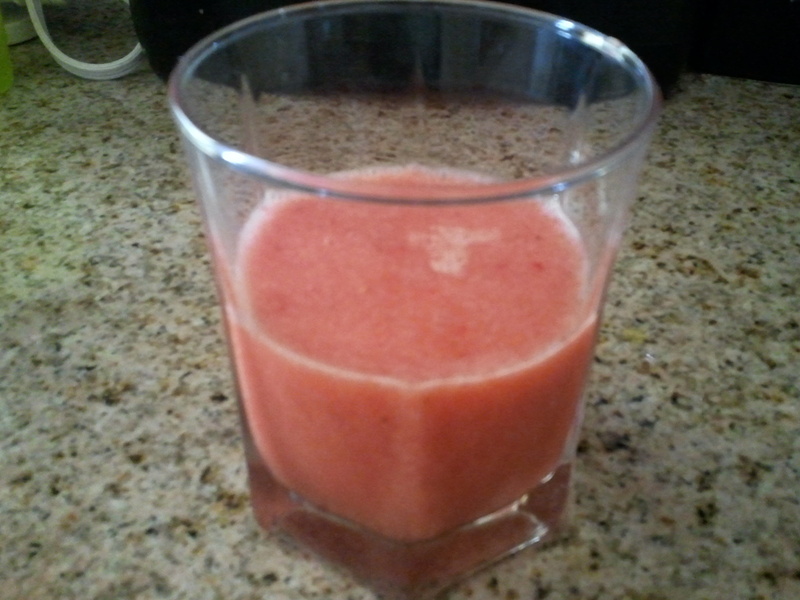 This time, I added no sugar, and it didn’t need it, it was sweet and tart with the cherries and limes as is. I have plenty of cherries still, but will either have to go get more limes or try it with lemon juice next time! Add cherries and water to blender; puree until smooth. 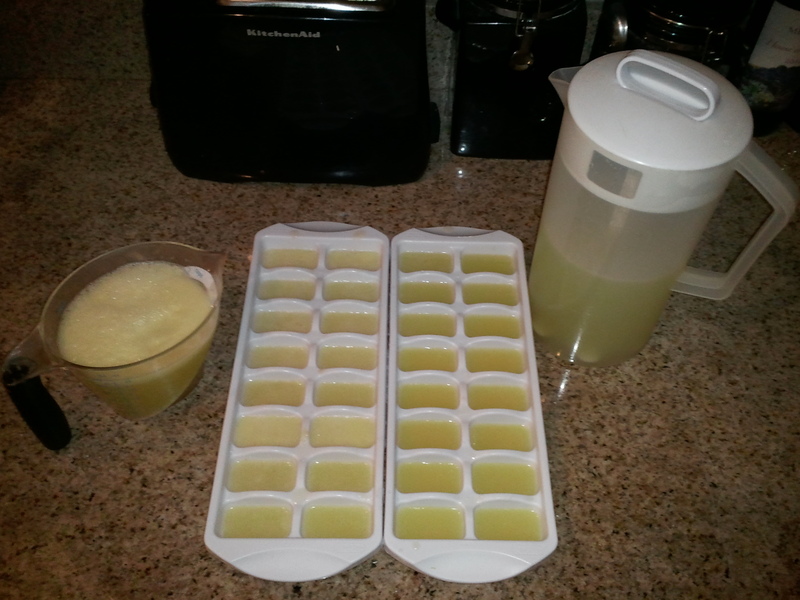 Add in frozen lime juice and ice cubes to blender, and blend until smooth. Serve immediately.